The film itself is only part of the movie-going experience. There's also the smell of fresh popcorn, the hushed murmer of the crowd as the lights go down, the smell of the sea air, the gentle lapping of the waves—wait, what? 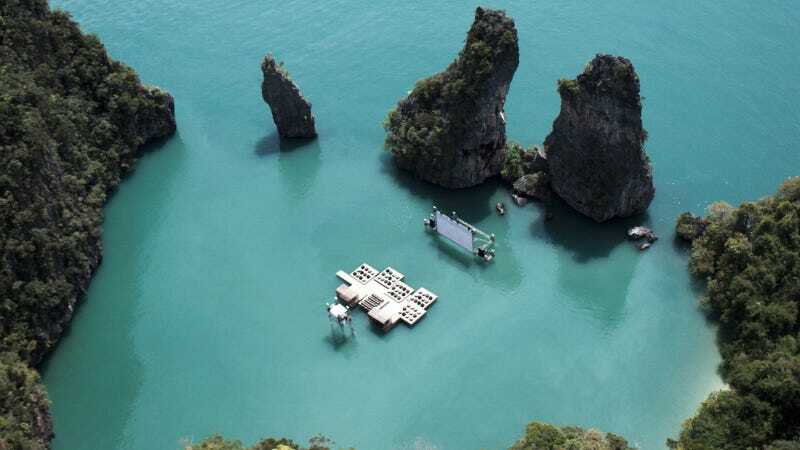 Architect Ole Scheeren built the auditorium-raft, dubbed the Archipelago Cinema, as part of Thailand's Film on the Rocks Yao Noi Festival, which ran earlier this month. The Cinema is designed after local lobster farms and constructed from recycled materials. And, at the end of the festival, the floating cinema was dismantled and donated to a local village.